More than just a joyful noise. 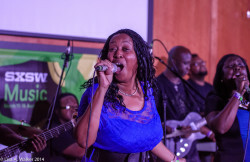 The three-generation gospel collective’s high-energy performances are the living embodiment of the indelible connection between the black church and its rock and soul offspring. —Austin Chronicle. “When a gospel band blows away the heathens at SXSW time after time, the rest of us should take notice,” says the Midwest Record of The Jones Family Singers, modern practitioners of a long musical tradition that fuses reverent, old-time gospel with elements of vintage soul and RandB, a la Sharon Jones and The Dap Kings and Aretha Franklin. The renowned group is led by Bishop Fred Jones, who has resided over the congregation at Mount Zion Church of God In Christ in Markham, TX for three decades. Made up of many members of the bishop’s family, the group’s fiery recordings, mostly recorded live in church, date as far back as the late ’80s, and have inspired eight invites to SxSW and Austin City Limits. Their latest, The Spirit Speaks, got rave shout outs by everyone from Rolling Stone to the Wall Street Journal. Buoyed by the new LP, the Jones Family Singers are tearing it up in churches, nightclubs and big music festivals. In addition to Tulsa Roots Rocks the Green, The Jones Singers will play The Lincoln Center and Austin City Limits festival.